Kids have this thing they do where they are constantly growing—and, therefore, constantly in need of new clothes. Now parents burnt out of trips to the mall have a new alternative: Launching today, Stitch Fix Kids allows parents (and kids) to get style boxes delivered to their doorsteps on a totally customizable schedule and budget. "At Stitch Fix, our goal has always been to help our clients discover products and styles they love," says Katrina Lake, founder and CEO of Stitch Fix. "Now, we want to inspire the same confidence in our littlest clients. 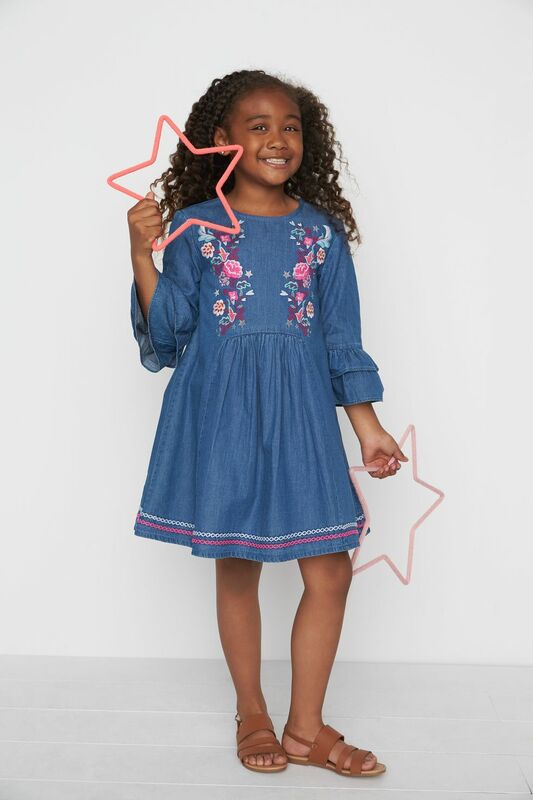 Stitch Fix Kids is a fun and engaging way for kids to find clothes they love and feel their best in, while saving parents time." Like the grown-up service, the fixes for kids sized 2T to 14 mix brands that most of us already know—such as TOMS, Hanna Andersson, Nike and more—as well as pieces exclusive to Stitch Fix. The company is even launching their very own kids' line, Rumi + Ryder, which features play wear for boys and girls. Best of all? Each box includes eight to 12 clothing items for prices ranging from $10 for leggings to $35 for items like outerwear. To get started, parents and their kids can have fun creating a Style Profile online, paying the $20 styling fee (that can be applied to the purchase of an item), scheduling the delivery and then waiting for the big try-on session. Afterward, keep what you want and send the rest back—with free shipping both ways. Or, if the whole box is a hit, you get a 25% discount on the purchase. After that, you can wait for your child's next growth spurt to order or schedule another fix right away. But with clothes this cute, we'll be looking for an excuse to order again ASAP. Target's Cat and Jack baby box is back—but you better act fast!